Everybody has a favourite tale to tell about the most unusual and spectacular fish they've owned or heard about. Unfortunately, most of these fish facts could just as easily be fishy fiction, as they're difficult to verify - but there are some strange and unusual fish tales out there that will amaze you. Tales of record breaking tropical fish. Although the biggest tropical fish kept by hobbyists are naturally limited by the size of their tanks, some of them get pretty huge - it's not unheard of for dedicated enthusiasts to keep five foot sharks in tanks in their own homes! 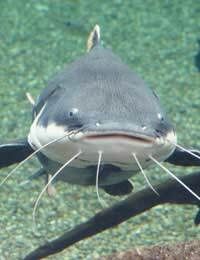 Still, even that doesn't compare to one humble catfish. This amazing specimen, a close relative of species commonly kept in aquaria, was caught in the Mekong Delta, where fish are hunted both for food and to supply the aquarium trade. Nine feet in length, it weighed a massive forty six stone, making it the biggest freshwater fish ever found. It was a catfish. The smallest fish, on the other hand, is also the world's smallest vertebrate. It took a while for scientists to notice it in the wild because, as well as being as little as 7mm in length even as an adult, it's almost transparent. Some aquarists are getting very excited about this fish, but you'd have to pay close attention to spot it in your tank. Ironically, it's known as the stout infantfish. The infantfish is as small as it is partly because it forsakes other aspects of growth - including scales and pelvic fins - in order to reach sexual maturity as fast as possible, increasing the chance that it will breed successfully before predators find it. But some other fish do this even faster. The Australian coral reef pygmy goby, a past contender for the title of World's Smallest Fish, lives fast and dies young at only eight weeks of age - just three weeks into its adult life. The record for the longest lived tropical fish is heavily disputed, though the rule is that the warmer the water it lives in, the shorter a fish's lifespan will be. Some cichlids live upwards of fifteen years, but that's nothing to the common goldfish, which can live into its forties. However, if taking life easy is the trick, there's one marine fish that has it beat. That record goes to the climbing perch from India, which can not only walk about out of the water but can actually climb trees, using its bony gill plates to hook into the bark. Climbing perches have been successfully kept in captivity, but you'd need a very special set-up to enable them to perform this trick. Speaking of special set-ups, there have been many contenders for the title of World's Biggest Aquarium, but it's now widely accepted that this belongs to Georgia Aquarium in the US city of Atlanta, which contains 6.3 million gallons of water. To put that in perspective, it provides enough space for four whale sharks, the biggest fish of all, to swim around, alongside three beluga whales and a gigantic manta ray. The manta ray is the largest of all the rays - this one has a twenty foot 'wingspan', but they have been known to grow up to twice that size! Fortunately, most of the rays kept by aquarium hobbyists stay smaller, but it just goes to show that you always need to make sure you know what you're letting yourself in for.